GLYPHOSATE RESISTANT CANADA fleabane is spreading rapidly across the province. If you do not have it yet, you likely will very soon. Fall asleep on this one and the impact will be massive. Fall weed control in winter wheat should be automatic. There are so many benefits. 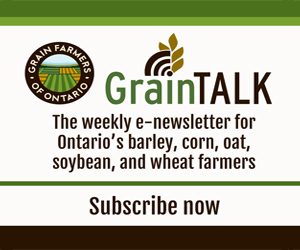 Better control of perennial and winter annual weeds, better options to get red clover established, and now, managing glyphosate resistant fleabane. I have promoted this for years, so I was SHOCKED when our Agribusiness breakfast meeting survey showed far less than five percent of wheat received a fall herbicide. Unbelievable! PHOTO: Canada fleabane escapes following winter wheat. Mike Cowbrough estimates 58 million seeds per acre are produced in a scenario like this. Talk about seeding your neighbour’s fields. PHOTO: Once you see the “fluff”, those seeds are viable. Clipping or chemical control now can stop some of the rest, but these guys are trouble. PHOTO: There are a lot of other reasons for fall weed control. Look what happens when you miss! Yield loss in this strip will be over 20 bushels/acre.